Action Bronson is a charismatic live performer, often armed with gifts for his adoring fans. Heading back on the road for the first time since 2017, Bronson announces “The White Bronco Tour,” his next nationwide tour. 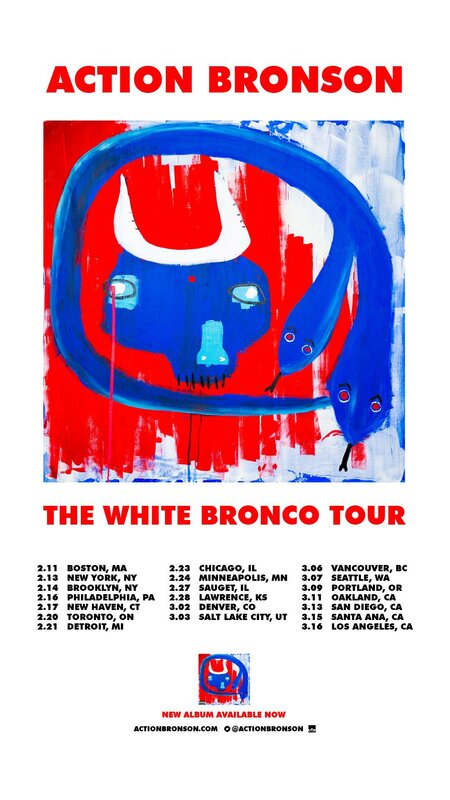 Commencing on February 11th in Boston, MA, the “White Bronco Tour” spans both coasts, making 21 stops in the United States and Canada, including two hometown shows in New York City, and concluding in San Diego on March 17th. Featuring support from Roc Marciano and longtime Bronson collaborator Meyhem Lauren, the upcoming tour will feature music from White Bronco, Bronson’s new album and his first independent album since 2012. Purchase tickets for “The White Bronco Tour” here. The follow-up to 2017’s Blue Chips 7000, White Bronco features production from Bronson’s longtime collaborator Party Supplies, as well as contributions from Knxwledge, Harry Fraud, Daringer, Samiyam and Bronson’s live band The Special Victims’ Unit. With a surreal front cover painted by the Queens-born icon himself, White Bronco showcases a liberated Action Bronson, free from constraints or distractions. The album features singles such as the soul-sampling “Prince Charming,” and the psychedelic title track, which received acclaim from Pitchfork, who raved “Bronson proves he’s still one of rap’s most vivid trash-talkers, bragging about his Lamborghini trucks, red leather jackets, and the 20 alligator hides that went into making his shoes, while comparing his musical swagger to Tiger Woods’ smooth swing and his ladies-man status to that of Taye Diggs.”. Featuring appearances from A$AP Rocky, Meyhem Lauren, Yung Mehico, and Big Body Bes, White Bronco is available now on all DSPs via EMPIRE. A burgeoning media mogul and a celebrated figure in the culture, Action Bronson never stops working. Born Ariyan Arslani, Bronson started his career as a gourmet chef, rapping only as a hobby, until he garnered overwhelmingly positive critical attention with his first mixtape Dr. Lecter, released in 2011. Packing his rhymes with references to fine food, culinary practices, professional wrestling, obscure sports figures, and more, Dr. Lecter and its popular follow-up Blue Chips quickly built Bronson’s reputation as a lyricist. Singing to Atlantic Records through a partnership with VICE, Bronson charted at #7 on Billboard with his major label debut Mr. Wonderful in 2015, which featured the Gold-certified single “Baby Blue,” featuring Chance The Rapper. Since the release of that album, Bronson expanded into filmed media, starting a web-based mini-series for Vice entitled “Action in the Kitchen,” which played off the artist’s love of food and music. The success of “Action in the Kitchen” led to “F*ck, That’s Delicious,” a full-fledged TV series and a flagship show on Viceland, where Bronson travels the world, meeting chefs and cooks and tasting everything from haute cuisine to street vendor favorites. Bronson also released a cookbook of the same name, which spent several weeks on the New York Times Best-Seller list. Bronson expanded his television empire into the realm of the metaphysical with Viceland’s 2017 series “Traveling the Stars: Ancient Aliens with Action Bronson,” and he currently hosts “THE UNTITLED ACTION BRONSON SHOW,“ a free-form talk show on Viceland. Bronson ended his relationship with Vice in 2018 and independently released his album White Bronco on November 1st.